I frequently get questions from my readers regarding “Which solar panel should I choose? Which panels are the best?” Though it is difficult to choose one amongst the variety of solar panel brands available in the market today, you can surely narrow down your search to three or four best suppliers suiting your needs. Here is a step wise guide you should consider before buying a solar panel. Though there are many other small factors as well, I have only listed the five important ones. 1) The first step is for you to decide your Requirement. Do you need the solar panel for residential, commercial, lighting or for an industrial purpose? All solar panels specifically mention their applications. Depending on it you can narrow down your search. 2) Next you should compare the efficiency and power output of the panels shortlisted. By Efficiency I mean the rate at which the panels can convert the solar energy into power. The panels with higher efficiency will be better because you will require lesser number of them to generate the same amount of power as is generated from higher number of low efficiency panels. This will also save the area of panel installation. Good quality panels have efficiency ~20%, but generally you get 14-18% efficient panels. 3) Power output is the DC current that the panels produce. The panels with higher power rating are better. Generally the power rating is 200-350W on the panels. 4) Another very important factor to keep in mind is the Manufacturer’s Credibility. It is important to see whether the brand you are buying is bankable or not, its history, experience, its annual performance etc. In other words, will the company still survive to serve its 25 years panel warranty? You should always go for reliable brands, but it is difficult since many new companies have gotten into panel manufacturing business. 5) Cost is definitely an important factor to consider while installing panels. After you have assessed the efficiency and power output of the panels, you would be able to calculate the number of panels required, based on your daily consumption of power. Hence you can calculate your total cost based on the per watt cost of a solar panel. Generally in India the price is Rs.35 per watt, after the decline in the prices of solar panels. You can also write to us on: http://www.greenworldinvestor.com/forums/topic/how-many-solar-panels-will-be-required-for-my-home/ for assessing your energy consumption. 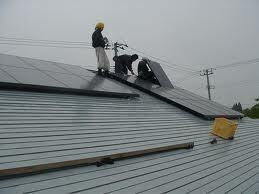 You can also read different Solar Panel reviews, to help to know about the panel specifications. You can also read Comparison of different Solar Panels, to help you choose between different brands. WHAT IS THE DIFFERENCE BETWEEN MONO AND POLY P.V. WHAT IS THE ADVANTAGE OF 24V AND 12 SOLAR PANEL.